The International Civil Aviation Organization (ICAO; Chinese: 国际民航组织 French: Organisation de l'aviation civile internationale) is a specialized agency of the United Nations. It codifies the principles and techniques of international air navigation and fosters the planning and development of international air transport to ensure safe and orderly growth. 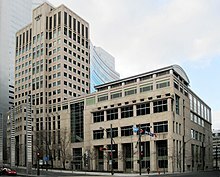 Its headquarters is located in the Quartier International of Montreal, Quebec, Canada. The ICAO Council adopts standards and recommended practices concerning air navigation, its infrastructure, flight inspection, prevention of unlawful interference, and facilitation of border-crossing procedures for international civil aviation. ICAO defines the protocols for air accident investigation that are followed by transport safety authorities in countries signatory to the Chicago Convention on International Civil Aviation. The Air Navigation Commission (ANC) is the technical body within ICAO. The Commission is composed of 19 Commissioners, nominated by the ICAO's contracting states and appointed by the ICAO Council. Commissioners serve as independent experts, who although nominated by their states, do not serve as state or political representatives. International Standards And Recommended Practices are developed under the direction of the ANC through the formal process of ICAO Panels. Once approved by the Commission, standards are sent to the Council, the political body of ICAO, for consultation and coordination with the Member States before final adoption. ICAO is distinct from other international air transport organizations, particularly because it alone is vested with international authority (among signatory states): other organizations include the International Air Transport Association (IATA), a trade association representing airlines; the Civil Air Navigation Services Organization (CANSO), an organization for Air navigation service providers (ANSPs); and the Airports Council International, a trade association of airport authorities. The forerunner to ICAO was the International Commission for Air Navigation (ICAN). It held its first convention in 1903 in Berlin, Germany, but no agreements were reached among the eight countries that attended. At the second convention in 1906, also held in Berlin, 27 countries attended. The third convention, held in London in 1912 allocated the first radio callsigns for use by aircraft. ICAN continued to operate until 1945. Fifty-two countries signed the Chicago Convention on International Civil Aviation, also known as the Chicago Convention, in Chicago, Illinois, on 7 December 1944. Under its terms, a Provisional International Civil Aviation Organization (PICAO) was to be established, to be replaced in turn by a permanent organization when 26 countries ratified the convention. Accordingly, PICAO began operating on 6 June 1945, replacing ICAN. The 26th country ratified the Convention on 5 March 1947 and, consequently PICAO was disestablished on 4 April 1947 and replaced by ICAO, which began operations the same day. In October 1947, ICAO became an agency of the United Nations under its Economic and Social Council (ECOSOC). In April 2013, Qatar offered to serve as the new permanent seat of the Organization. Qatar promised to construct a massive new headquarters for ICAO and to cover all moving expenses, stating that Montreal "was too far from Europe and Asia", "had cold winters", was hard to attend due to the Canadian government's slow issuance of visas, and that the taxes imposed on ICAO by Canada were too high. According to The Globe and Mail, Qatar's invitation was at least partly motivated by the pro-Israel foreign policy of Canadian Prime Minister Stephen Harper. Approximately one month later, Qatar withdrew its bid after a separate proposal to the ICAO's governing council to move the ICAO triennial conference to Doha was defeated by a vote of 22–14. The 9th edition of the Convention on International Civil Aviation includes modifications from years 1948 up to 2006. ICAO refers to its current edition of the Convention as the Statute and designates it as ICAO Document 7300/9. The Convention has 19 Annexes that are listed by title in the article Convention on International Civil Aviation. As of January 2019[update], there are 192 ICAO members, consisting of 191 of the 193 UN members (all but Dominica and Liechtenstein, both of which lack international airports), plus the Cook Islands. Despite Liechtenstein not being a direct party to ICAO, its government has delegated Switzerland to enter into the treaty on its behalf, and the treaty applies in the territory of Liechtenstein. The Republic of China was a founding member of ICAO but was replaced by People's Republic of China as the legal representative of China in 1971 and as such, did not take part in the organization. In 2013, the Republic of China was for the first time invited to attend the ICAO Assembly, at its 38th session, as a guest under the name of Chinese Taipei. ICAO also standardizes certain functions for use in the airline industry, such as the Aeronautical Message Handling System (AMHS). This makes it a standards organization. Each country should have an accessible Aeronautical Information Publication (AIP), based on standards defined by ICAO, containing information essential to air navigation. Countries are required to update their AIP manuals every 28 days and so provide definitive regulations, procedures and information for each country about airspace and airports. ICAO's standards also dictate that temporary hazards to aircraft must be regularly published using NOTAMs. ICAO defines an International Standard Atmosphere (also known as ICAO Standard Atmosphere), a model of the standard variation of pressure, temperature, density, and viscosity with altitude in the Earth's atmosphere. This is useful in calibrating instruments and designing aircraft. The standardized pressure is also used in calibrating instruments in-flight, particularly above the transition altitude. ICAO is active in infrastructure management, including Communication, navigation and surveillance / Air Traffic Management (CNS/ATM) systems, which employ digital technologies (like satellite systems with various levels of automation) in order to maintain a seamless global air traffic management system. ICAO has published standards for machine-readable passports. Machine-readable passports have an area where some of the information otherwise written in textual form is also written as strings of alphanumeric characters, printed in a manner suitable for optical character recognition. This enables border controllers and other law enforcement agents to process such passports more quickly, without having to enter the information manually into a computer. ICAO's technical standard for machine-readable passports is contained in Document 9303 Machine Readable Travel Documents. A more recent standard covers biometric passports. These contain biometrics to authenticate the identity of travellers. The passport's critical information is stored on a tiny RFID computer chip, much like information stored on smartcards. Like some smartcards, the passport book design calls for an embedded contactless chip that is able to hold digital signature data to ensure the integrity of the passport and the biometric data. Both ICAO and IATA have their own airport and airline code systems. ICAO uses 4-letter airport codes (vs. IATA's 3-letter codes). The ICAO code is based on the region and country of the airport—for example, Charles de Gaulle Airport has an ICAO code of LFPG, where L indicates Southern Europe, F, France, PG, Paris de Gaulle, while Orly Airport has the code LFPO (the 3rd letter sometimes refers to the particular flight information region (FIR) or the last two may be arbitrary). In most parts of the world, ICAO and IATA codes are unrelated; for example, Charles de Gaulle Airport has an IATA code of CDG. However, the location prefix for continental United States is K, and ICAO codes are usually the IATA code with this prefix. For example, the ICAO code for Los Angeles International Airport is KLAX. Canada follows a similar pattern, where a prefix of C is usually added to an IATA code to create the ICAO code. For example, Calgary International Airport is YYC or CYYC. (In contrast, airports in Hawaii are in the Pacific region and so have ICAO codes that start with PH; Kona International Airport's code is PHKO. Similarly, airports in Alaska have ICAO codes that start with PA. Merrill Field, for instance is PAMR.) Note that not all airports are assigned codes in both systems; for example, airports that do not have airline service do not need an IATA code. ICAO also assigns 3-letter airline codes (versus the more-familiar 2-letter IATA codes—for example, UAL vs. UA for United Airlines). ICAO also provides telephony designators to aircraft operators worldwide, a one- or two-word designator used on the radio, usually, but not always, similar to the aircraft operator name. For example, the identifier for Japan Airlines International is JAL and the designator is Japan Air, but Aer Lingus is EIN and Shamrock. Thus, a Japan Airlines flight numbered 111 would be written as "JAL111" and pronounced "Japan Air One One One" on the radio, while a similarly numbered Aer Lingus would be written as "EIN111" and pronounced "Shamrock One One One". In the US, FAA practices require the digits of the flight number to be spoken in group format ("Japan Air One Eleven" in the above example) while individual digits are used for the aircraft tail number used for unscheduled civil flights. ICAO maintains the standards for aircraft registration ("tail numbers"), including the alphanumeric codes that identify the country of registration. For example, airplanes registered in the United States have tail numbers starting with N.
ICAO is also responsible for issuing 2-4 character alphanumeric aircraft type designators for those aircraft types which are most commonly provided with air traffic service. These codes provide an abbreviated aircraft type identification, typically used in flight plans. For example, the Boeing 747-100, -200 and -300 are given the type designators B741, B742 and B743 respectively. Emissions from international aviation are specifically excluded from the targets agreed under the Kyoto Protocol. Instead, the Protocol invites developed countries to pursue the limitation or reduction of emissions through the International Civil Aviation Organization. ICAO's environmental committee continues to consider the potential for using market-based measures such as trading and charging, but this work is unlikely to lead to global action. It is currently developing guidance for states who wish to include aviation in an emissions trading scheme (ETS) to meet their Kyoto commitments, and for airlines who wish to participate voluntarily in a trading scheme. Emissions from domestic aviation are included within the Kyoto targets agreed by countries. This has led to some national policies such as fuel and emission taxes for domestic air travel in the Netherlands and Norway, respectively. Although some countries tax the fuel used by domestic aviation, there is no duty on kerosene used on international flights. ICAO is currently opposed to the inclusion of aviation in the European Union Emission Trading Scheme (EU ETS). The EU, however, is pressing ahead with its plans to include aviation. On October 6, 2016, the ICAO finalized an agreement among its 191 member nations to address the more than 7003100000000000000♠1000 million tonnes of carbon dioxide emitted annually by international passenger and cargo flights. The agreement will use an offsetting scheme called CORSIA (the Carbon Offsetting and Reduction Scheme for International Aviation) under which forestry and other carbon-reducing activities are directly funded, amounting to about 2% of annual revenues for the sector. Rules against 'double counting' should ensure that existing forest protection efforts are not recycled. The scheme does not take effect until 2021 and will be voluntary until 2027, but many countries, including the US and China, have promised to begin at its 2020 inception date. Under the agreement, the global aviation emissions target is a 50% reduction by 2050 relative to 2005. NGO reaction to the deal was mixed. although another critic called it "a timid step in the right direction." Most air accident investigations are carried out by an agency of a country that is associated in some way with the accident. For example, the Air Accidents Investigation Branch conducts accident investigations on behalf of the British Government. ICAO has conducted four investigations involving air disasters, of which two were passenger airliners shot down while in international flight over hostile territory. Libyan Arab Airlines Flight 114 which was shot down on 21 February 1973 by Israeli F-4 jets over the Sinai Peninsula during a period of tension that led to the Arab-Israeli Yom Kippur War killing 108 people. Korean Air Lines Flight 007, which was shot down on 1 September 1983 by a Soviet Su-15 interceptor near Moneron Island just west of Sakhalin Island during a period of heightened Cold War tension killing all 269 people on board including U.S. Representative Larry McDonald. UTA Flight 772, which was destroyed by a bomb on 19 September 1989 above the Sahara Desert in Niger, en route from N'Djamena, Chad, to Paris, France. The explosion caused the aircraft to break up, killing all 156 passengers and 15 crew members, including the wife of U.S. Ambassador Robert L. Pugh. Investigators determined that a bomb placed in the cargo hold by Chadian rebels backed by Libya was responsible for the explosion. A French court convicted in absentia six Libyans of planning and implementing the attack. The 1996 shootdown of Brothers to the Rescue aircraft on 24 February 1996, when two civilian aircraft operating north of Cuba were shot down by two jets of the Cuban Air Force. The Cuban military alleged that aircraft operated by the group Brothers to the Rescue had scattered propaganda leaflets onto Cuba prior to the incident, and issued orders that such aircraft be shot down. All four crew members aboard the two aircraft were killed, whilst a third aircraft managed to escape and return to the American mainland. ICAO is looking at having a singular ledger for drone registration to help law enforcement globally. Currently, ICAO is responsible for creating drone regulations across the globe, and it is expected that it will only maintain the registry. This activity is seen as a forerunner to global regulations on the drone flying under the auspices of the ICAO. ICAO currently maintains the 'UAS Regulation Portal' for various countries to list their country's UAS regulations and also review the best practices from across the globe. ^ a b Höhne, Sebastian. "IT in general Aviation: Pen and Paper vs. Bits and Bytes" (PDF). hoehne.net. p. 38. Retrieved 5 May 2014. ^ "Air Navigation Commission". ICAO. Retrieved 7 August 2013. ^ a b "Registrations". Golden Years of Aviation. Archived from the original on 30 January 2011. Retrieved 11 February 2011. ^ "1912 Radio Callsign prefixes". Golden Years of Aviation. Archived from the original on 1 January 2011. Retrieved 11 February 2011. ^ "icao.int International Civil Aviation Organization History". Retrieved 28 July 2017. ^ Baird fighting 'tooth and nail' to keep UN aviation office in Montreal, CBC News, 2 May 2013. ^ Disgruntled Arab states look to strip Canada of UN agency by Campbell Clark, The Globe and Mail, 2 May 2013. ^ Canada now paying the price for Baird's misstep into East Jerusalem by Michael Bell, Special to The Globe and Mail, 6 May 2013. ^ ICAO stays in Montreal after Qatar stumbles Archived 3 June 2013 at the Wayback Machine by François Shalom, The Montreal Gazette, 24 May 2013. 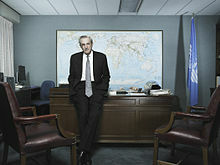 ^ "Lobbying saved Montreal's UN aviation agency, Paradis says". CBC News. 24 May 2013. Retrieved 24 May 2013. ^ Qatar Withdraws Offer to Host ICAO Permanent Seat, ICAO Newsroom, 24 May 2013. ^ "Annex 19 on Security Management". Archived from the original on 10 December 2013. Retrieved 31 May 2017. ^ "Member States" (PDF). ICAO. Retrieved 19 July 2017. ^ "Member States.English.pdf" (PDF). ICAO. Retrieved 20 July 2014. The Minister of Switzerland made the following statement in the note transmitting the Swiss Instrument of Ratification: "My Government has instructed me to notify you that the authorities in Switzerland have agreed with the authorities in the Principality of Liechtenstein that this Convention will be applicable to the territory of the Principality as well as to that of the Swiss Confederation, as long as the Treaty of 29 March 1923 integrating the whole territory of Liechtenstein with the Swiss customs territory will remain in force". ^ "ICAO Assembly elects new Council for three-year term". www.icao.int. ^ Manual of the ICAO Standard Atmosphere: extended to 80 kilometres (262,500 feet) (in English, French, Spanish, and Russian) (3rd ed.). Montreal: ICAO. 1993. ISBN 92-9194-004-6. Archived from the original (CD-ROM) on 6 December 2012. Retrieved 6 September 2012. ^ "Infrastructure Management". ICAO. Retrieved 6 September 2012. ^ "Welcome to the ICAO Machine Readable Travel Documents Programme". ICAO. Retrieved 6 September 2012. ^ Machine Readable Travel Documents, Document 9303 (Sixth ed.). ICAO. 2006. Retrieved 9 August 2013. ^ "DOC 8643 - Aircraft Type Designators". ICAO. 1 February 2019. Retrieved 1 February 2019. ^ "Contact Us". ICAO. Retrieved 6 September 2012. ^ "Dr. Fang Liu of China Becomes First-Ever Woman Appointed Secretary General of ICAO". ICAO. 11 March 2015. Retrieved 4 July 2017. ^ "Climate Change: Aviation Emissions, an ignored but fast growing problem" (PDF). greenskies.org. 2005. Retrieved 3 August 2011. ^ Milman, Oliver (6 October 2016). "First deal to curb aviation emissions agreed in landmark UN accord". The Guardian. London, United Kingdom. Retrieved 20 October 2016. ^ Henry Fountain (25 September 2016). "'Aviation's Paris Moment' as Nations Near Emissions Deal". NYT. Retrieved 26 September 2016. ^ Henry Fountain (6 October 2016). "Over 190 Countries Adopt Plan to Offset Air Travel Emissions". NYT. Retrieved 7 October 2016. ^ Weak Market-based Measure Allows Airplanes' Greenhouse Pollution to Triple, press release by Center for Biological Diversity and Friends of the Earth. 6 October 2016. ^ David Pearson (1987). KAL 007: Cover-up. New York: Summit Books. p. 266. ISBN 978-0-671-55716-4. ^ Ranter, Harro. "ASN Aircraft accident McDonnell Douglas DC-10-30 N54629 Ténéré desert". aviation-safety.net. Retrieved 31 May 2017. ^ "UN proposes global database for drone registration". Geospatial World. 6 October 2017. Retrieved 6 October 2017. ^ "UAS Regulation Portal". www.icao.int. Archived from the original on 7 October 2017. Retrieved 6 October 2017.